Among the TV series Star Trek's many charms are its rich universe of characters and planets. Now, the Dharma Planet Survey, in a new study led by University of Florida (UF) astronomer Jian Ge and team including Tennessee State University (TSU) astronomers Matthew Muterspaugh and Gregory Henry, has shown that science fiction may be a little less so; the Dharma project has discovered what may be Star Trek's famed planet Vulcan. "The new planet is a 'super-Earth' orbiting the star HD 26965, which is only 16 light years from Earth, making it the closest super-Earth orbiting another Sun-like star," says Ge. "The planet is roughly twice the size of Earth and orbits its star with a 42-day period just inside the star's optimal habitable zone." The discovery was made using the Dharma Endowment Foundation Telescope (DEFT), a 50-inch telescope located atop Mt. Lemmon in southern Arizona. 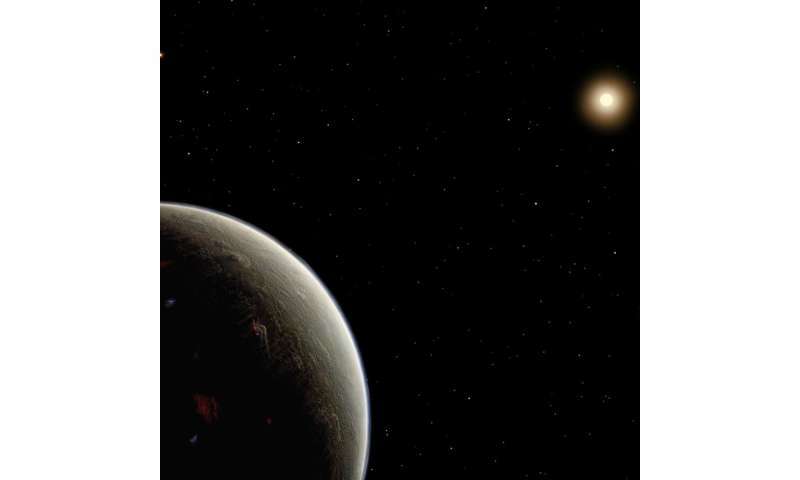 The planet is the first "super-Earth" detected by the Dharma Survey. "The orange-tinted HD 26965 is only slightly cooler and slightly less massive than our Sun, is approximately the same age as our Sun, and has a 10.1-year magnetic cycle nearly identical to the Sun's 11.6-year sunspot cycle," explains Muterspaugh, who helped to commission the Dharma spectrograph on the TSU 2-meter automatic spectroscopic telescope. "Therefore," he adds, "HD 26965 may be an ideal host star for an advanced civilization." "Star Trek fans may know the star HD 26965 by its alternative moniker, 40 Eridani A," says Henry, who collected precise brightness measurements of the star at TSU's automated observatory needed to confirm the presence of the planet. "Vulcan was connected to 40 Eridani A in the publications "Star Trek 2" by James Blish (Bantam, 1968) and "Star Trek Maps" by Jeff Maynard (Bantam, 1980)," explains Henry. In a letter published in the periodical "Sky and Telescope" in July 1991, Gene Roddenberry, the creator of Star Trek, along with Sallie Baliunas, Robert Donahue, and George Nassiopoulos of the Harvard-Smithsonian Center for Astrophysics confirmed the identification of 40 Eridani A as Vulcan's host star. The 40 Eridani star system is composed of three stars. Vulcan orbits the primary star, and the two companion stars "would gleam brilliantly in the Vulcan sky," they wrote in their 1991 letter. "Vulcan is the home planet of Science Officer Mr. Spock in the original "Star Trek" Sci-Fi series," says Henry. "Spock served on the starship Enterprise, whose mission was to seek out strange new worlds, a mission shared by the Dharma Planet Survey." "This star can be seen with the naked eye, unlike the host stars of most of the known planets discovered to date. Now anyone can see 40 Eridani on a clear night and be proud to point out Spock's home," says Bo Ma, a UF postdoc on the team and the first author of the paper just published in Monthly Notices of the Royal Astronomical Society. "This discovery demonstrates that fully dedicated telescopes conducting high-cadence, high-precision radial velocity observations in the near future will continue to play a key role in the discovery of more super-Earths and even Earth-like planets in the habitable zones around nearby stars," says Ge. "I am very grateful to the donor of our Dharma Planet Survey, Mr. Mickey Singer, who recognized the importance of this project and has continuously provided support to make this and future discoveries possible." This is a fun article I enjoyed. However, if a species reminiscent of the Vulcans actually exist (other than us I suppose), I suspect they are lot further than 16 light years away. One can only hope our first contact is with a species as benevolent. According to WIKI, a planet in the HZ of 40 Eridani A would orbit in ~ 223 Earth days. This one orbits in 42 days. Seems a bit too close to me. Possible clickbait headline? That's my "Mission In Life!" Amazing how much effort the enthusiasts for pop fiction will put into contorting reality to fit into those little comicbook boxes. "The habitable zone of 40 Eridani A, where a planet could exist with liquid water, is near 0.68 (calculated from habitable zone) AU from A. At this distance a planet would complete a revolution in 223 Earth days (according to the third Kepler's law) and 40 Eridani A would appear nearly 20%[note 3] wider than the Sun does on Earth." .22 AU being the distance instead of .68 and 42.38 plus or minus .01 days as the orbital period. Oh yeah, duh. lol. I hate it when they say potentially habitable and it's like tidally locked with a dwarf constantly blasting out ionizing radiation. If there is absolutely no life out there, then the entire universe is wide open for colonization. A trillion, trillion planets just waiting for us to arrive. Because this would mean zero risk space exploration in terms of encounters with alien life, this is an arguably even better scenario to boldly go where no comicbook dreamer has gone before! BTW, Star Trek was a television show, not a comic book, at least as I have experienced it. "Amazing how much effort the enthusiasts for pop 'science' will put into contorting reality to fit into those little" ... 'text' books. I agree with your assumption of distance. If such creatures exist on a far away planet, then they might be looking through their telescopes at us, depending on how far their technology has advanced in comparison to ours. Whether or not their technology is far advanced than ours though, the crux is in their attitudes of whether they have deep respect for life and limb - or not. Here on Earth, we have a mixed bag of attitudes toward Life and the Pursuit of Happiness. Some want to kill us; some want to OWN us; and some want to tax us to death. Very few here are willing to just leave everyone alone to their own fortunes. BTW, my ears are just a tad pointy. I guess the astronomer quoted for this article, Matthew Muterspaugh, didn't mention that one of the 3 stars making up the Eridani star system is a White Dwarf because he didn't want to ruin the fun. One of the stars in this system is a White dwarf with 50% of the mass of our sun. For it to have gone through all the stages of stellar development to become a white dwarf we see now means it was much more massive than A is currently. It also means the planet had to deal with the original larger star going through its red giant phase which is quite destructive to a terrestrial planet's atmosphere. The time that has elapsed since the system became what we now see is simply too short and prior to that the system too hot for intelligent life to have evolved. Even as fun, that Matthew Muterspaugh speculated thusly makes me wonder what he was smoking. Would the discovery of this planet affect the classification of Eridani A, or the other stars B and C in the binary system, or is it's 8 earth mass insignificant to the orbital mechanics of the system. Sol will extend to between Earth and Mars, when it becomes a red giant, Eridani B the white dwarf star orbits 400 AU from this planet,It would only have reached about 1 and a half AU in size when it was a red giant. Too close to its host star, no good. or is it's 8 earth mass insignificant to the orbital mechanics of the system. 8 Earth masses is really nothing compared to a star. For comparison: Our sun holds about 333000 Earth masses. While 40 Eridani A is a bit smaller and cooler than our sun (as most stars are, BTW) that's still 40000 times more massive than this newly found planet. True, but maybe there is another planet closer to 0.68 AU in 40 Eridani A's habitable zone, who knows? A planet that large is also likely to have a think atmosphere that will cook the planet at 0.22 AU, but we will have to wait for more studies. How apropos considering that Venus and Vulcan were married. A typical Olympian marriage. Made in Hades! Repented in Eternity. Roddenberry and three Harvard astrophysicists wrote in their Sky and Telescope letter that 40 Eridani A was the better candidate for Vulcan's star since it was 4 billion years old (similar to Earth) while Epsilon Eridani was only 1 billion years old.